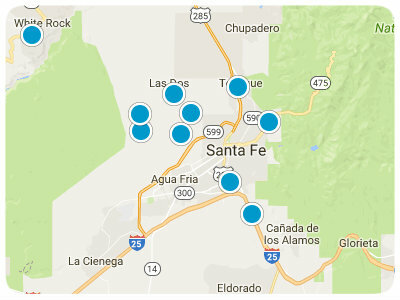 Located near the Santa Fe National Forest, Santa Fe Southwest is an excellent neighborhood to call home. Available properties in this area are located on roads such as Airport Road, Zia Road, and Rodeo Road, and real estate options include single-family homes, condos, and estates. Commercial properties and office spaces are also readily accessible. Homes for sale in this area feature a wide variety of sizes and architectural styles, so you are certain to find something that fits your budget and personal preferences. When you choose to live in this area, you will have plentiful entertainment opportunities at your fingertips. For example, if you like spending time outdoors, then you will enjoy exploring the nearby parks and natural areas. The Santa Fe National Forest and the Sangre de Cristo Mountains are breathtakingly beautiful, and you will enjoy seeing everything these natural wonders have to offer. Exhilarating hikes and invigorating strolls can become part of your everyday life as you explore places such as Thompson Peak, and you will appreciate the incredible views of the surrounding landscape. When you are ready for a more metropolitan adventure, you can easily travel the short distance to dynamic Santa Fe. This city has earned its reputation as an arts hub, and you will have the chance to attend captivating live performances at the Santa Fe Opera, discover astounding artwork in the Georgia O’Keeffe Museum, and tour the interesting Museum of International Folk Art. You may also choose to shop at the Santa Fe Farmers Market or attend a fun local festival. No matter where your adventures lead you, you will be content to think of your wonderful single-family home, condo, or estate awaiting your return in Santa Fe Southwest. An unrivaled location, many enjoyable entertainment opportunities, and stunning natural scenery are only a few examples of what you will enjoy about living in this area. Homes for sale on Airport Road, Rodeo Road, and Zia Road in Santa Fe Southwest are ready to pique your interest. If you are ready for more information regarding Santa Fe Southwest real estate options, please do not hesitate to contact us.